Secure web forms? Yep, we have them…and you can, too! 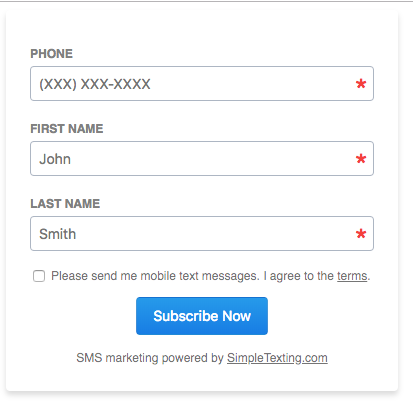 Adding a secure web form to your site takes less than two minute! This step-by-step video will show you how. Access to Web Sign-Up Forms is granted upon request and subject to verification by our compliance team. To obtain access to web forms, simply contact us at [email protected] or using the blue chat bubble. To expedite the approval process, please be sure that you have a complete, accurate, and verifiable account profile. To edit your account profile, simply click on your account name in the top right corner of the dashboard and select Profile. Update or complete your profile, then save your changes. 4. 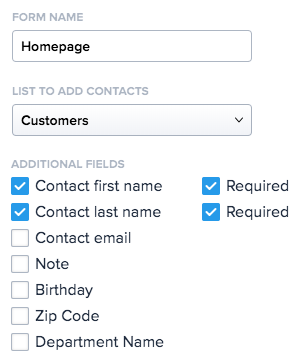 Give the form a name, choose the list you'd like to add the contacts to a select the fields you'd like to collect. The phone number field is added automatically. 5. Adjust the frequency field. This is how many message you plan to send each subscriber every month. 6. Click Save. Your form is ready! 2. Copy and paste the code to add it to your website. You can insert the code to your website as a link, Iframe or as HTML that can be styled to match your website. 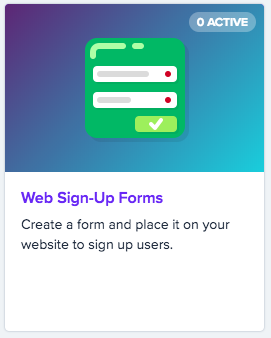 You will need at least one subscriber to sign up through your web form before you will be able to choose that subscriber list for message delivery and/or some app-based features.